Home Grown: In a city where locavores rule, a new office building showcases regional materials and innovative construction techniques. Define the term “mass timber” and explain what distinguishes it from other types of wood construction. Describe the fire-resistive and structural properties of mass timber. 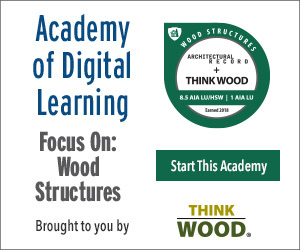 Outline the environmental attributes of mass-timber construction. Describe the lateral load-resisting system planned for Portland, Oregon’s Framework building. 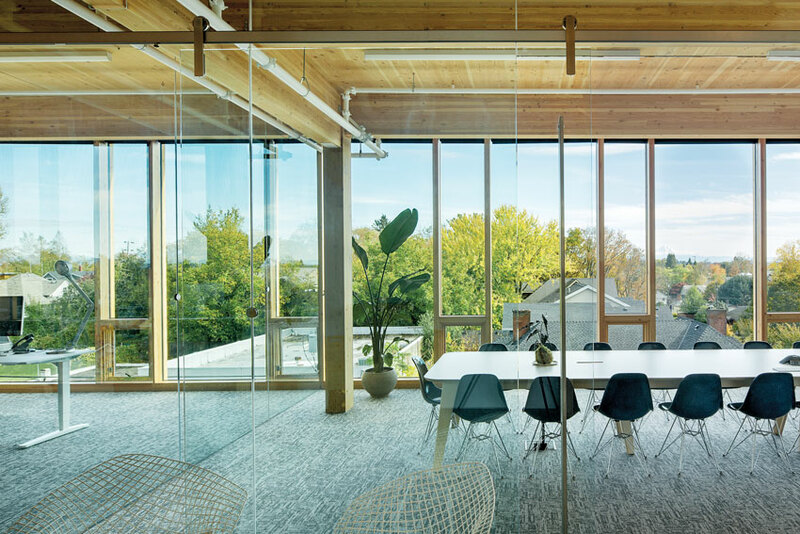 Although only four stories tall, Albina Yard, a spec office building, stands out among its one- and two-story neighbors in the scrappy residential and commercial district in north Portland, Oregon. Looking up from the street through the horizontal bands of the glass facade, the ceilings of each level—planes of warm Douglas fir—are visible. These elements are not just finish material but the building’s exposed floor plate. Designed by Portland’s LEVER Architecture, Albina Yard, completed in 2016, is one of a handful of buildings in the U.S. constructed using a mass-timber structural system. The divide between the new office building and its grittier context is bridged by the architect’s use of understated formal moves and a humble material palette. The scale of the street elevation is modulated and delineated in a subtle dance of cantilevers. The second story projects straight out to form a shallow protected zone over the storefront at the ground-floor retail space. The facades of the third and fourth floors twist a few degrees off the grid in opposite directions. The effect is like a stack of books slightly askew. Dark corrugated-metal siding, which clads the side walls and other opaque parts of the building, complements the nearly complete two-story office annex (also designed by LEVER) made of shipping containers and located in the rear courtyard of the L-shaped lot. The mass-timber elements of the four-story Albina Yard (left and right) serve as both structure and interior finish material. The exterior, which reads as a slightly askew pile of books, is clad in glass and corrugated metal. Although timber-framed construction has been around for thousands of years, mass timber is a more contemporary spinoff. Instead of solid wood beams and columns made from large trees, mass-timber frames incorporate engineered wood products such as cross-laminated timber (CLT), laminated veneer lumber (LVL), and nail laminated timber (NLT). Such components bind together small wood elements to form strong structural units. Above its concrete foundation, Albina Yard has an all-wood structure. The architects designed a grid of glue-laminated (glulam) columns and beams with CLT panels acting as floor plates. Used for floor structures, walls, and even elevator cores, CLT panels are made up of three or more layers of dimensional lumber bonded with structural adhesives. Since the layers are stacked in alternating orientations, the panels are strong and lightweight and are able to span in two directions, in a manner similar to that of a two-way concrete slab. The bonded cross-lamination makes CLTs dimensionally stable, preventing the significant shrink and swell inherent in many wood products. The approach has been used in Europe for a couple of decades and is spreading rapidly in Canada and the U.S. This momentum has spawned an informal competition, pushing mass-timber buildings to new heights from mid-rise to high-rise construction. The current record holder is the 160-foot-tall, 14-story Treet residential building in Bergen, Norway (Record, September 2015, page 116). Specially engineered and fabricated steel brackets (bottom) connect the columns, beams, and floor plates. These are mostly buried within the wood components and are hardly visible on the building’s interior (top). According to Thomas Robinson, LEVER’s founder, the firm decided to use this type of construction because of the client’s interest in sustainable strategies and regionally sourced materials. Designing with locally grown and fabricated elements saves energy and transportation costs. Robinson also sees projects like Albina Yard as a means to help reinvigorate Oregon’s depressed timber industry. “We can connect the explosive growth in our cities to rural economic development,” he says. The timber industry in the Pacific Northwest has never fully recovered from the recession in the 1980s and subsequent forestry regulations that curtailed the supply of large trees for construction. CLT and the other engineered-wood products used in mass-timber structures rely on smaller diameter and potentially more sustainable second-growth trees, says Professor Thomas Maness, dean of the forestry department at Oregon State University. He adds that mass-timber products can generate an array of highly skilled jobs, from those on the forest floor to others in high-tech fabrication facilities. 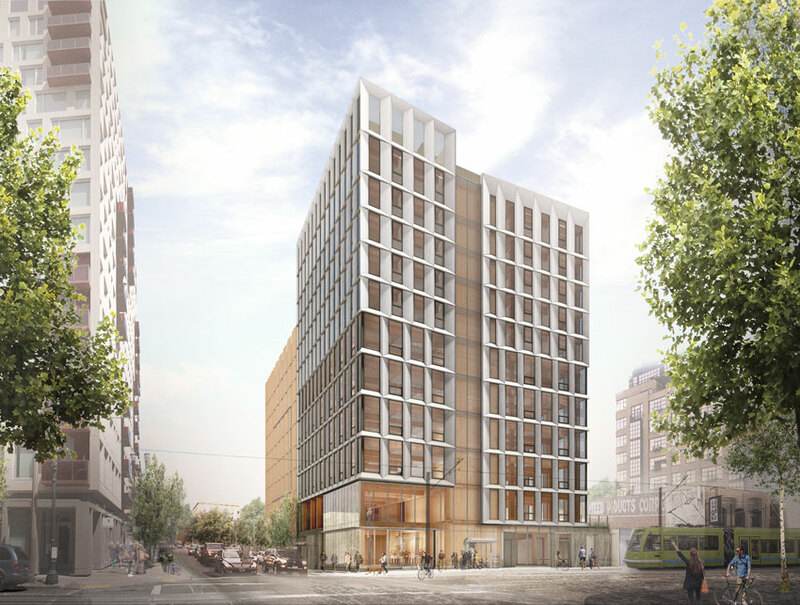 The 12-story, 145-foot-tall Framework tower (top), expected to be the tallest mass-timber building in the U.S. once complete, will have a “rocking wall” core (bottom) designed to self-center after a seismic event. In many ways, Albina Yard has served as a test bed for a much more ambitious LEVER Architecture project: the 12-story mixed-use Framework building in downtown Portland, Oregon. It was one of two projects that split the $3 million U.S. Tall Wood Building Prize, sponsored by the U.S. Department of Agriculture, the Softwood Lumber Board, and the Binational Softwood Lumber Council. At approximately 145 feet tall, Framework is expected to become the tallest mass-timber building in the U.S. High-rise buildings typically rely on the shear walls that define a circulation core to stiffen the structure. In an earthquake or in high winds, the floor diaphragms transfer the lateral forces to the shear walls that resist and absorb movement. 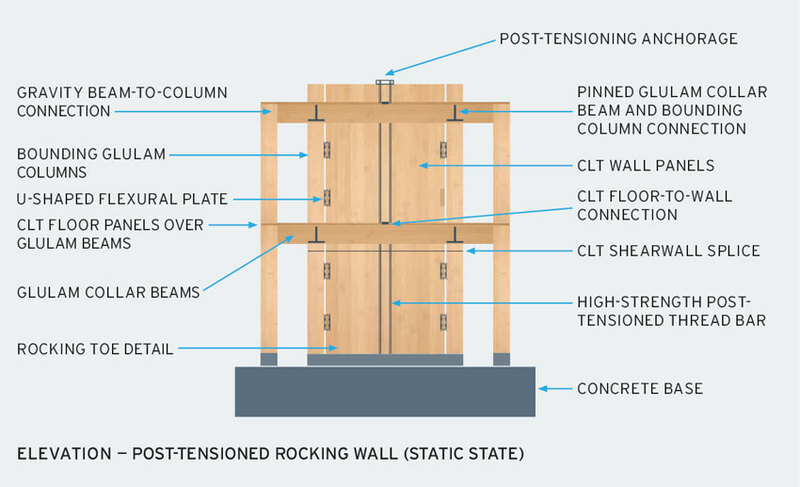 But Framework will have an innovative core system: a so-called “rocking wall” made up of vertical CLT panels. Instead of trying to prevent the panels from moving in a seismic event, the designers have placed post-tensioned cables down the center of the wall to allow the ends of the panels to rock up and then pull the wall back into position to “self center.” According to Eric McDonnell, a structural engineer with KPFF in Portland, “With most traditional systems, like a concrete shear wall, the building won’t necessarily come back to level once the shaking stops.” LEVER principal Thomas Robinson adds that the team performed extensive testing with Oregon and Portland state universities to develop the resilient low-damage system. Between the shear walls and the adjacent columns, the design team used a U-shaped flexural plate (UFP) that allows differential movement and absorbs energy. If the UFPs are damaged in an earthquake, they act like seismic “fuses” that can be replaced fairly easily, potentially saving costly repairs. High-rise construction also has stringent fire-safety standards. Falling under the Type I-B noncombustible construction category, Framework’s mass timber structural frame is required to have a two-hour fire rating. LEVER partnered with fire-prevention experts at ARUP to devise tests for the CLTs and the structure’s connection brackets. The team successfully tested the world’s first two-hour rated, fully loaded beam-column-floor assembly made of mass timber. Although wood is very combustible on its surface, once a layer of char forms, it insulates and slows the burning process, according to McDonnell. Framework’s components—such as beams, columns, and floor plates—have been oversized to account for the extra depth of char while maintaining enough structural integrity to achieve the two-hour rating. The USDA grant enabled LEVER and ARUP to subject loaded, full-scale mockups to combustion tests. According to ARUP fire-safety engineer David Barber, a major challenge was designing and testing the connectors, which needed to work aesthetically and structurally while standing up to the two-hour fire-rating requirement. 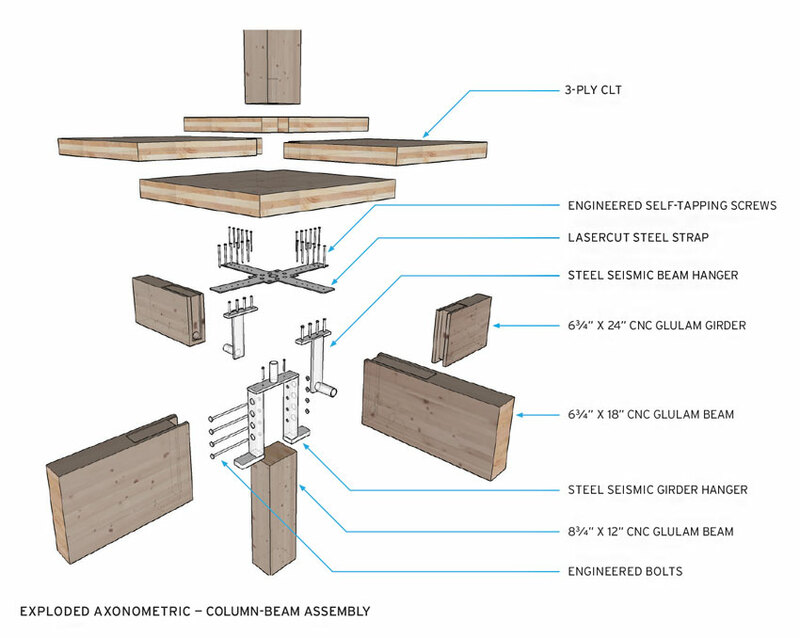 Similar to what they did for the Albina Yard connectors, the team designed brackets that are totally encased by the wood structure, which makes them more fire-resistant. The project has passed its life-safety tests and is currently in the final phase of permitting. Ground breaking is slated for this fall. M.C.